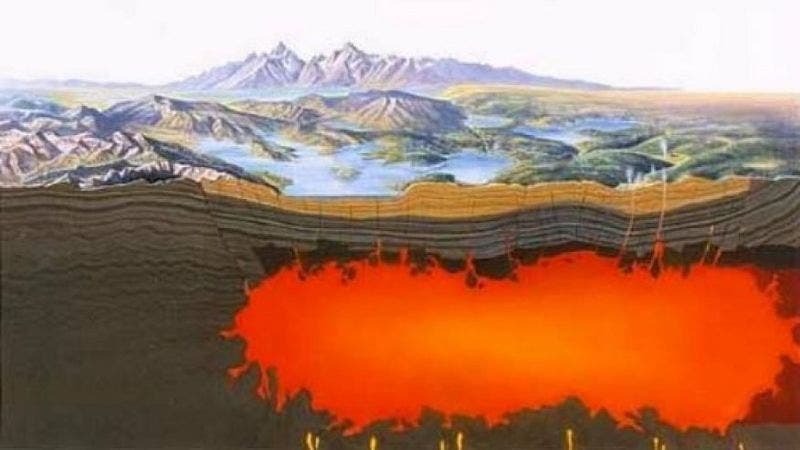 For the first time, scientists have started to map the vast subterranean systems that underlie the massive Yellowstone Supervolcano to better predict if and when a ‘super-eruption’ could occur – something that hasn’t happened in 630,000 years, but when it did, it created the largest volcanic crater of its kind on the planet. Geologists have identified three super-eruptions: the Huckleberry Ridge eruption 2.1 million years ago; the Mesa Falls eruption 1.3 million years ago; and the Lava Creek eruption roughly 630,000 years ago. The three supervolcano eruptions at Yellowstone – on the Wyoming-Idaho-Montana border – covered much of North America in volcanic ash. A supervolcano eruption today would be cataclysmic, but experts says the annual chance is 1 in 700,000. Starting this week, the U.S. Geological Survey (USGS), in collaboration with the Aarhus University in Denmark and the University of Wyoming, will use a helicopter carrying electromagnetic technology that resembles a giant hula hoop to record tiny voltage signals. The entire Yellowstone Supervolcano is a vast volcanic field, covering an area of roughly 55 by 72 km (34 by 45 miles), where lava eruptions and geysers, and steam vents litter the otherworldly landscape. The data will be able to tell the scientists if they are flying over solid earth, “rotten” sulfuric rock, or water. Carol Finn, one of the scientists on the surveying team, said she has been looking forward to this for ten years. The goal of the project is to fill in the gaps of knowledge about what causes geysers like Old Faithful and hydrothermal explosions by locating where all that heated water flows underground. “There’s just a lot we don’t know and this survey is really exciting because it’s going to be the first view of a large portion of the groundwater system, of the water underground that feeds all of these thermal features,” said Finn. The survey will also provide information that could help the park in the future by locating unstable ground. The researchers will fly the helicopter along the Mammoth-Norris corridor and take at least four weeks to complete.